It’s essential that all businesses take IT security seriously. Cyber Essentials is a government backed scheme that allows organisations to show that they are taking suitable steps to protect themselves from cyber attack. We work with many organisations as their IT advisor and are ideally placed to guide them through the process. As your application progresses we take our time to explain the various themes and how they impact on your business. The accreditation is a great way to show to your customers that you are taking necessary steps to keep data secure. It’s also a great opportunity to reassess your systems and processes with the application needing to be signed off by a senior member of staff before being sent to the external accreditation body. The areas covered by Cyber Essentials will help protect critical business data from loss, theft and corruption. 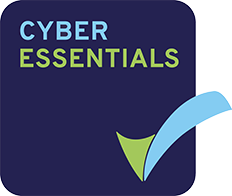 Many organistaions now require you to have gained the Cyber Essentials accreditation when tendering for contracts. By using the Cyber Essentials logo you can demonstrate to clients and suppliers that you are taking steps to protect their data. Having Cyber Essentials accreditation can help reduce your businesses Cyber Insurance premiums. Knowing that many organisations do not have an in-house IT expert, Ace IT have developed a simple 4 step process to help you achieve the accreditation. By working as your IT security advisor we will guide you through the entire application. Before starting an application for Cyber Essentials an IT Security expert will visit your business and review your systems and procedures relating to the areas covered by the Cyber Essentials Scheme. Following the visit we will present you with a report of how your business compares to the current guidelines for Cyber Essentials. This will identify any weaknesses or risks in your IT Security and document any changes that need to be made before starting the Cyber Essentials assessment. We will install new or amend existing systems so that they meet the requirements for Cyber Essentials. We will also advise on any changes that are needed to IT procedures and staff guidelines. Once all the recommendations are complete we will help you complete and submit the online assessment with our Cyber Essentials Partner, IT Governance.